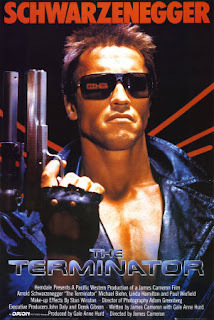 AI is starting to ramp up, as most techies know, but what has not been discussed regarding bots that would house AI in the real world, was the significant issue of being able to develop inexpensive, lightweight muscles able to do real work with low energy requirements akin to The Terminator, a concept considered not feasible until now. Vanadium dioxide is poised to join the pantheon of superstars in the materials world. Already prized for its extraordinary ability to change size, shape and physical identity, vanadium dioxide can now add muscle power to its attributes. A team of researchers with the U.S. Department of Energy (DOE)'s Lawrence Berkeley National Laboratory (Berkeley Lab) has demonstrated a micro-sized robotic torsional muscle/motor made from vanadium dioxide that for its size is a thousand times more powerful than a human muscle, able to catapult objects 50 times heavier than itself over a distance five times its length within 60 milliseconds – faster than the blink of an eye. It get rather interesting when combining this tech to AI using neural net configured chips able to learn in similar fashion to how we learn using trial & error as prime driver to enable us to navigate the world in relatively proper fashion. The new processors consist of electronic components that can be connected by wires that mimic biological synapses. Because they are based on large groups of neuron-like elements, they are known as neuromorphic processors, a term credited to the California Institute of Technology physicist Carver Mead, who pioneered the concept in the late 1980s. 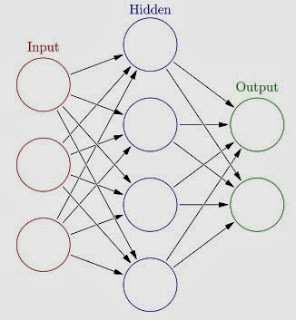 They are not “programmed.” Rather the connections between the circuits are “weighted” according to correlations in data that the processor has already “learned.” Those weights are then altered as data flows in to the chip, causing them to change their values and to “spike.” That generates a signal that travels to other components and, in reaction, changes the neural network, in essence programming the next actions much the same way that information alters human thoughts and actions. 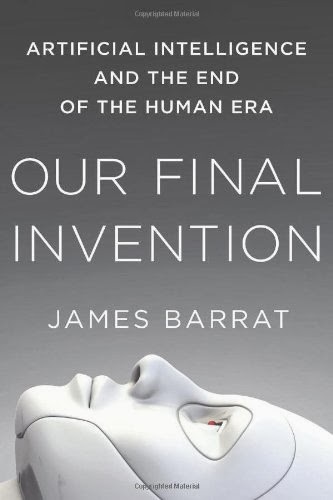 When taken to logical extremes, an alien intelligence, of our own makig, will emerge, a construct forever unknowable to us as systems such as these will program themselves in order to become more intelligent, a process that will happen millions of times faster than evolution, a notion brilliantly articulated in a new book titled Our Final Invention, James Barrat's wake up call to the profound implications of AI and what it could mean to mankind's continued existence on planet earth. the theory and development of computer systems able to perform tasks that normally require human intelligence, such as visual perception, speech recognition, decision-making, and translation between languages. On a supercomputer operating at a speed of 36.8 petaflops, or about twice the speed of a human brain, an AI is improving its intelligence. It is rewriting its own program, specifically the part of its operating instructions that increases its aptitude in learning, problem solving, and decision making. At the same time, it debugs its code, finding and fixing errors, and measures its IQ against a catalogue of IQ tests. Each rewrite takes just minutes. Its intelligence grows exponentially on a steep upward curve. That’s because with each iteration it’s improving its intelligence by 3 percent. Each iteration’s improvement contains the improvements that came before. 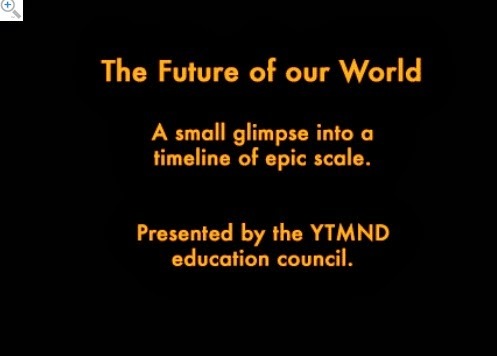 During its development, the Busy Child, as the scientists have named the AI, had been connected to the Internet, and accumulated exabytes of data (one exabyte is one billion billion characters) representing mankind’s knowledge in world affairs, mathematics, the arts, and sciences. Then, anticipating the intelligence explosion now underway, the AI makers disconnected the supercomputer from the Internet and other networks. It has no cable or wireless connection to any other computer or the outside world. Soon, to the scientists’ delight, the terminal displaying the AI’s progress shows the artificial intelligence has surpassed the intelligence level of a human, known as AGI, or artificial general intelligence. Before long, it becomes smarter by a factor of ten, then a hundred. In just two days, it is one thousand times more intelligent than any human, and still improving. The scientists have passed a historic milestone! For the first time humankind is in the presence of an intelligence greater than its own. Artificial superintelligence, or ASI. Addendum: read Why the Future Doesn't Need Us by Bill Joy, a brilliant and chilling analysis of Robotics (W/AI), Genetic Engineering and Nanotech, by one of the true software geniuses of the connected age. If nothing else, it gives pause to the meaning of AI and what it portends to us as we move further into the 21st century. 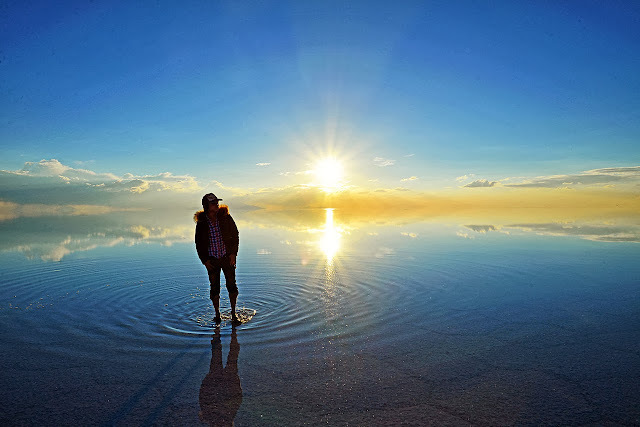 When it rains at Bolivia’s Salar de Uyuni (the world’s largest salt flat), the landscape transforms into a giant and shallow reflection pool. And if you happen to capture the phenomenon at sunset, you get a beautiful photograph like this. Yours truly loves intense tech designed to deal with intense environments, in this case, Antarctica, the coldest place on earth where Maria Leijerstam became the first person to get to the South Pole using a recumbent bike designed by Inspired Cycle Engineering to do the deed. Until now, no one reached the South Pole through cycling. Last winter, polar explorer Eric Larsen attempted to become the first person to cycle to the South Pole, but due to extreme adverse weather, he was forced to abandon the attempt. 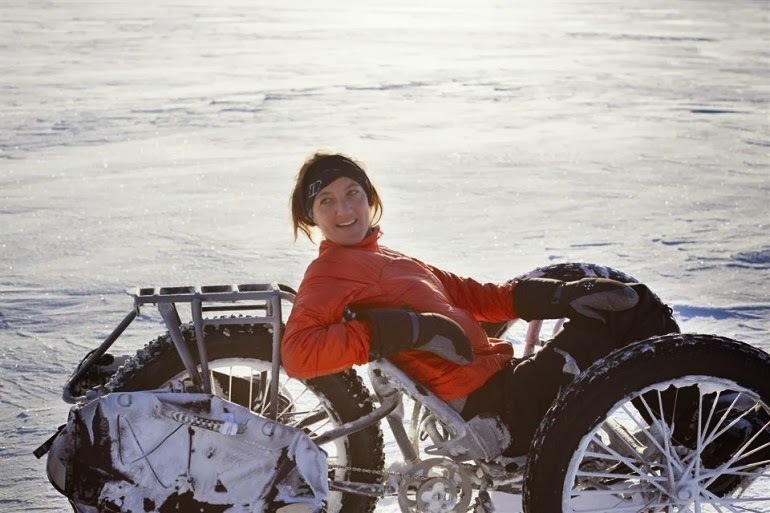 However, this year many people also attempted to become the first person to cycle to the South Pole, and finally, 35-year-old British adventurer Maria Leijerstam has become the very first person, cycling to the South Pole. However, to become the world’s first person reaching to the South Pole through cycling, Leijerstam used a recumbent fat-tired tricycle, nicknamed the White ICE Cycle, which is manufacturer by the UK’s Inspired Cycle Engineering (ICE). Land of Hope, the extraordinary Mosaicultures Internationales exhibit at Jardin Botanique Montreal, conveys a message of hope in terms of how we should deal with planet earth. With luck, this tribute to nature, using plants, combined with sculpture and creativity, will inspire man to become a better steward of the world in which we live. Day for Night, a delightful film done by Francois Truffaut back in 1973, showed, in great detail, how directors, back then, turned day into night using neutral density filters to accomplish the task at hand as the tech, back in 1973, obviously could not film scenes in near darkness in any way, shape or fashion, something all together different when compared to today's rapidly evolvng video technology. If you get a chance, watch this film as it's a gem. Back in November of 2011, BRT's post, Something to Consider, addressed the present day great dying we are generating today due to global warming, environment degradation and resource depletion, conditions man made, conditions rectifiable, conditions ongoing, thanks to governmental and corporate collusion performed at planetary scale, something changing life on this planet in ways not seen since the Great Dying of 250 million years ago. For the uninitiated, in the simplest terms, here’s what an ice-free Arctic would mean when it comes to heating the planet: minus the reflective ice cover on Arctic waters, solar radiation would be absorbed, not reflected, by the Arctic Ocean. That would heat those waters, and hence the planet, further. This effect has the potential to change global weather patterns, vary the flow of winds, and even someday possibly alter the position of the jet stream. Polar jet streams are fast flowing rivers of wind positioned high in the Earth’s atmosphere that push cold and warm air masses around, playing a critical role in determining the weather of our planet. We are already @ 400ppm. How high it goes, nobody knows. As stated before, phase transitions are exponential events, not linear, which give credence to the fact GW is happening faster then previously thought possible, something also being seen in species extinction due to the aforementioned troika of global warming, environment degradation and resource depletion, conditions eerily similar to the Permian era when the great dying occurred save that the changes happening today are thousands of times faster then when the Siberian Traps blew their tops way back when. 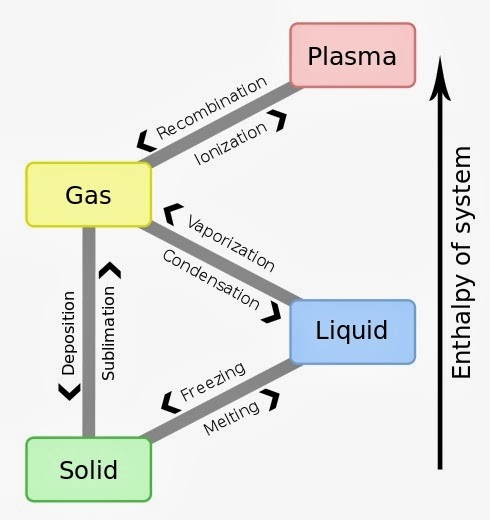 Seen below is the excellent Wikipedia graphic detailing the phase transition from plasma to solid. 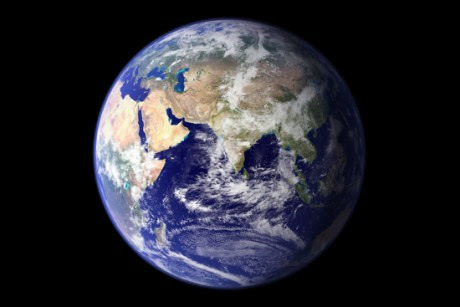 We are currently in the midst of what scientists consider the sixth mass extinction in planetary history, with between 150 and 200 species going extinct daily, a pace 1,000 times greater than the “natural” or “background” extinction rate. This event may already be comparable to, or even exceed, both the speed and intensity of the Permian mass extinction. The difference being that ours is human caused, isn’t going to take 80,000 years, has so far lasted just a few centuries, and is now gaining speed in a non-linear fashion. 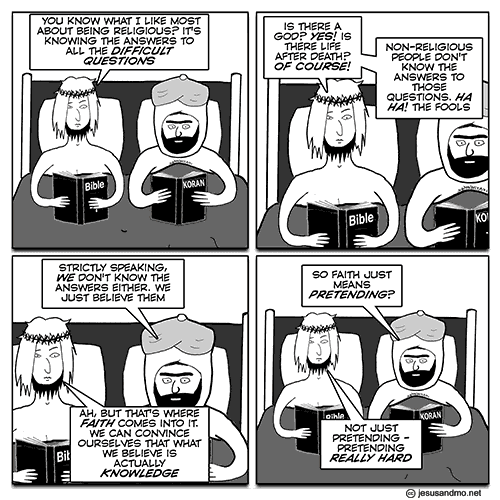 Being an atheist is still difficult as some people of faith have this amazing concept that us heathens have fewer scruples then they, something totally ludicrous to say the least. In politics, being an atheist is tantamount to election death as all the yahoos in congress must and do pledge allegiance to god in order to get elected as this has become the litmus test for electability, not competence, something we see in action by congress, a body of ineptness that truly knows no bounds of just how useless they are except that of pledging allegeance to god 24/7. Just see the never ending senatorial campaign in Arkansas to see why. In looking at this issue more closely, one finds that politics and religion are the only two professions not requiring a skill set in anything save the ability to be liked and talk a good line at a moment's notice. Regarding electability, check out the Politico chart seen above, showing that any atheist running for president stands little or no chance of winning though there were (gasp) closet atheists in the White House (Taft, Jefferson, Adams et al) and…god forbid, in the Founding Fathers, something the Sara Palins of the world seem to miss when ranting about god and this country being founded as a christian nation. To start, we atheists had a kindred spirit in Thomas Jefferson, who was often accused of being one of us. In 1787, Jefferson wrote in a letter to his nephew: “Question with boldness even the existence of a God; because if there be one, he must more approve the homage of reason than of blindfolded fear. … Do not be frightened from this inquiry by any fear of its consequences. If it end in a belief that there is no God, you will find incitements to virtue in the comfort and pleasantness you feel in its exercise and in the love of others which it will procure for you.” Jefferson fought tirelessly for the separation of church and state and created the University of Virginia to be the first secular university. He was not alone: John Adams wrote in the 1797 Treaty of Tripoli that ours was no more a Christian country than a Jewish or Islamic one. The Senate unanimously approved the treaty. 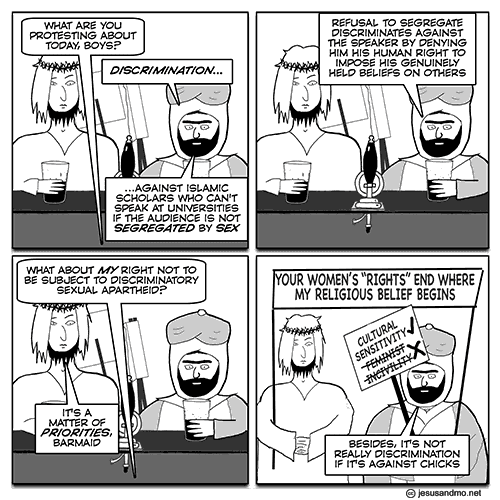 Things are changing for the better, particularly among the young, the most liberal and non religious group in society. 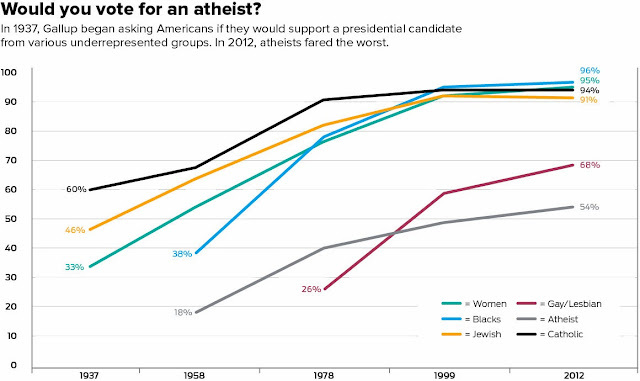 As they increase in number, the tolerance for atheists, like yours truly, will increase as it has for gays, something that bodes well for the reestablishment of women's rights and the eventual move to Single Payer as we move further into the 21st century. War Games for real. 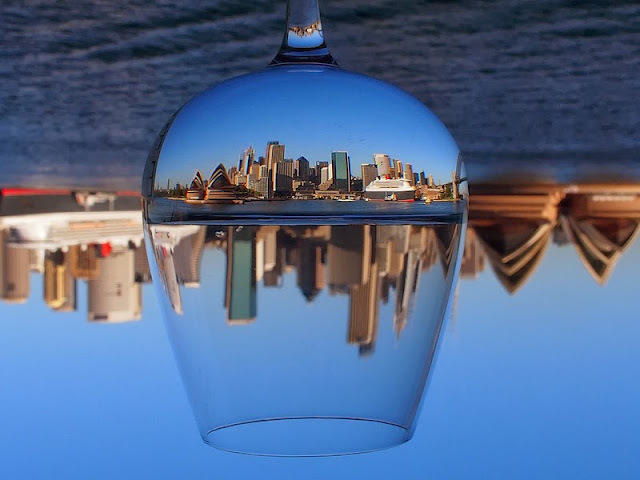 Awesome video from Josip Suij. It’s a simple concept. Flight patterns and common aviation hubs are more accurate predictors of the spread of disease than distances traveled on foot, slow boat, or horse. Brockmann had a lightbulb go off when a student, Daniel Grady, biked to his office at Northwestern University and remarked that no matter how he traveled--by subway, bus, or bike--it always took the same amount of time to get there. 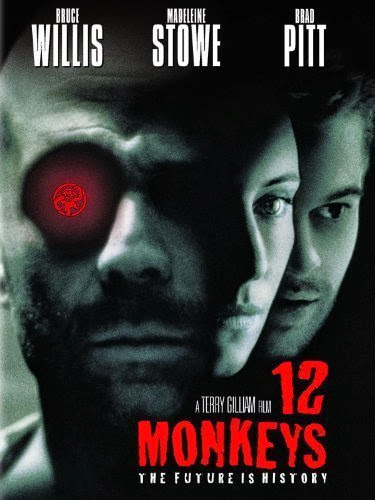 In the blink of an eye, 12 Monkeys anyone? Click here to get an in depth take on just how fast a pandemic could spread from London Heathrow Airport to 80 countries. Scary does not begin to say just how disruptive this event would be. Last month, BRT posted an article titled, Agent Smith was right, a piece discssing how man goes from place to place, taking all the resources of said place before moving on to plunder some other place even though we have now basically run out of places to pillage save for the Arctic, a region that was relatively safe from the predation of man until global warming reared it's ugly head, thus opening up a pristine frontier harboring, perhaps, the last significant deposits of oil and natural gas on the planet. 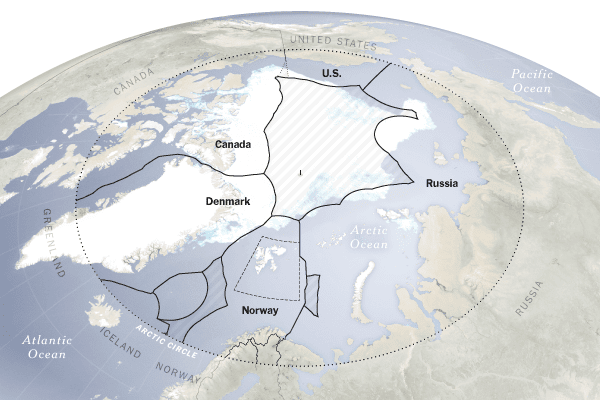 In addition, the Arctic itself has proved to be a formidable adversary: In the summer of 2012, during Royal Dutch Shell’s first attempt to probe its Arctic deposits, shifting winds and floating ice halted drilling. Several months later, when one of its drilling rigs ran aground during an especially severe storm, Shell announced that it would suspend operations in Alaska’s Arctic waters and that before it proceeded, it would bolster its capacity to operate there. Shell’s misfortunes have heightened concern that Arctic drilling poses an unacceptable threat to the region. 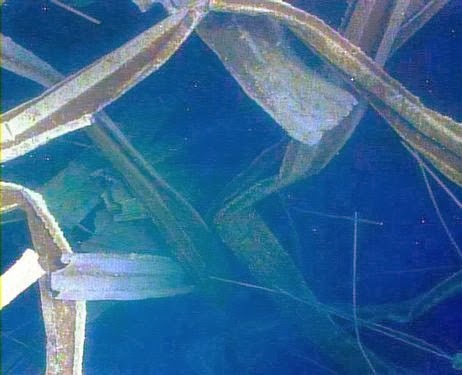 Any major spill that occurs there is likely to prove far more destructive than the one produced in the Gulf of Mexico by the Deepwater Horizon disaster in April 2010, because of both the lack of adequate response capabilities and the likelihood that ice floes and sea ice will impede cleanup operations. As more companies push into the Arctic and accelerate their operations there, the risk of accidents and spills is bound to increase. The fact that Shell — one of the most technically advanced oil companies — has so far proved unable to overcome these risks should provoke intense concern over the prospect that other, less proficient firms will soon be operating in these perilous waters. Bad tech being introduced into a hostile area, driven by greed and stupidity, is a recipe for disaster but we already know that, right? The intro ad is a drag but Jon is not regarding the government's and NSA's serial lying. BRT recently posted a blurb titled Feature Creep, whereby the NSA uses the network switch hack to not only scarf up our banking, social and email data but also to gather smartphone locations as needs dictate. Now it's leveraging Google's PREFID cookies to extend its reach into our buying and surfing habits to the nth degree as seen in a Washington Post article titled NSA uses Google cookies to pinpoint targets for hacking. The National Security Agency is secretly piggybacking on the tools that enable Internet advertisers to track consumers, using "cookies" and location data to pinpoint targets for government hacking and to bolster surveillance. The agency's internal presentation slides, provided by former NSA contractor Edward Snowden, show that when companies follow consumers on the Internet to better serve them advertising, the technique opens the door for similar tracking by the government. The slides also suggest that the agency is using these tracking techniques to help identify targets for offensive hacking operations. 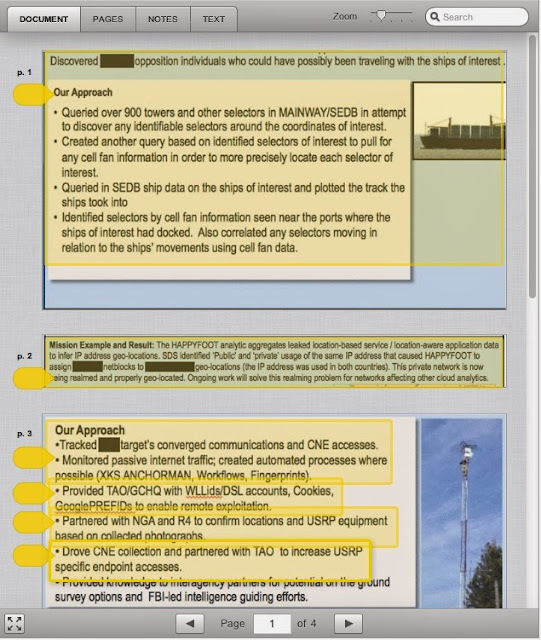 These specific slides do not indicate how the NSA obtains Google PREF cookies or whether the company cooperates in these programs, but other documents reviewed by the Post indicate that cookie information is among the data NSA can obtain with a Foreign Intelligence Surveillance Act order. If the NSA gets the data that way, the companies know and are legally compelled to assist. Without privacy we have no freedom, without privacy, 1984 looms. Click on the Washington Post graphic to see how the NSA uses Google's cookies to do the deed. Seymour Hersh is right, Edward Snowden's the real deal without question. 25% of the Georges Bank is totally protected from deep-sea trawling, the vacuum cleaner approach that nearly wiped out the cod industry back in the 1980's, something Europe should do but did not when they could not institute a similar ban though their seas are suffering as did the banks back in the day. PARIS — The European Parliament on Tuesday sided with the fishing industry by voting against an overall ban on deep-sea trawling, but it agreed to restrict some of the worst excesses of the practice. In a narrow vote of 342 to 326, with 19 abstentions, lawmakers rejected a proposal to phase out deep-sea trawling in which heavy nets are dragged on the ocean floor at depths of more than 600 meters, or about 2,000 feet. The Parliament, which meets in Strasbourg in eastern France, did vote to end trawling in areas with ecosystems most at risk, like those rich in slow-growing corals and sponges. And they inserted a requirement calling for a review of the equipment used in deep-sea fishing — including gill nets, which are either anchored to the ocean bottom or allowed to drift in the current, entrapping fish by their gills. In theory, the review could lead to a ban on all deep-sea fishing with gear found to be especially destructive. Another stunner. A no brainer on how tech, when placed in the hands of an artist, creates magic. Hippo Teahupoo from Chris Bryan on Vimeo. Awestruck is the operative term here as seen by this amazing video. As a techie, I view this news as a perfect example of feature creep where an enterprise like the NSA just extends their ability to spy on us by breaking into the switches of the Verizon's of the world to, in this case, track our cellphone locations, with little extra effort as this mirrors the same approach of ISP network switch hacking the NSA uses to ingest email, banking and social networks data as needs warrant. Seen below is a network diagram showing a typical connectivity diagram courtesy Wikipedia. This chart, courtesy the NY Times, shows, in small part, the incredible gouging of us chickens regarding the disastrous state of healthcare, a profit-driven environment that victimizes every American not covered by Medicare. In a medical system notorious for opaque finances and inflated bills, nothing is more convoluted than hospital pricing, economists say. Hospital charges represent about a third of the $2.7 trillion annual United States health care bill, the biggest single segment, according to government statistics, and are the largest driver of medical inflation, a new study in The Journal of the American Medical Association found. When looking at this fubar, one readily sees that Obamacare does not fix this problem in any way shape or fashion so, the question to ask is: When will passive Americans get off their butts and demand congress to institute Single Payer because the system, as it stands now, is a lost cause from the get go. A few weeks ago, in a post titled Design 101 or Why Adding People to a Late Project Makes It Later, BRT discussed, in depth, why Healthcare.gov was a disaster from the get go but that it would be fixed ($630 million & counting) while the fools who built the system in the first place, would continue to get paid by us rubes rather then be fired and fined for gross incompetence, something that would have gone down in the private sector without question but won't because it's government and incompetence is a virtue as long as one has the right connections to the agency footing the bill, something all too sad to see as per the NYTimes article titled Inside the Race to Rescue a Health Care Site, and Obama. Simply unreal. Gee, what an innovative approach, something Fred Brooks discussed, in great length, in Mythical Man Month, as to why a visionary system architect is ABSOLUTELY REQUIRED if any complex project is to succeed and... said visionary must be in place, prior to doing anything of significance, or said project will fail, a prerequisite totally ignored in the disastrous HC.Gov roll out in Oct, 2013. Note that even when healthcare.gov becomes capable, the much larger problem of HC itself has not been addressed as this slow motion catastrophe continues to run amuck, something only Single Payer can solve but you already knew that, right? 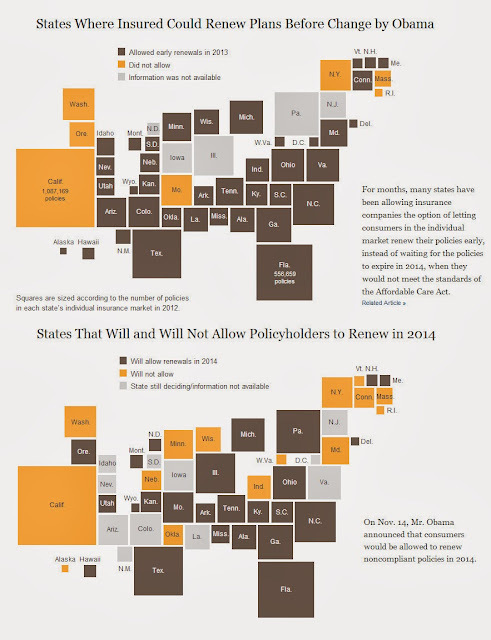 Factoid: Click on the graphic to find out what states actually allow insurance renewals pre & post Obama. Josiah Thompson's thought process is incredibly impressive. A true forensic scientist, he looks at cause and effect with persistence, intellect and objectivity, essential traits every real scientist exhibits when trying to discern how reality works at deep level, something the Warren Commission totally ignored when coming up with their take on what actually happened on November 22, 1963. This is a must see video to learn that Kennedy was killed via a conspiracy involving two shooters and possibly three. At the same time, click here to see the Errol Norris documentary of Thompson further explaining why the film and photos taken at the event "self authenticates" what happened in Dallas separate from any commentary that has issued forth from that dark and tragic day. 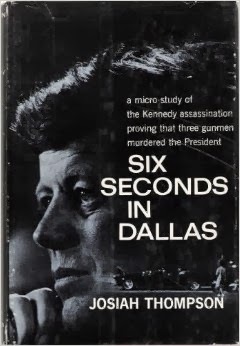 Hopefully, his 1967 book will be republished as the analysis done in this work should be read by every American who needs to know what really happened in Dallas. Back in November, 2011, BRT wrote a post titled Something to Consider, a riff on the Permian Extinction AKA the Great Dying whereby 90 - 95% of all life went the way of the Dodo due to a massive "injection of CO2 into the atmosphere", probably due to "the eruptions that formed the Siberian Traps, the stairlike hilly region in northern Russia." 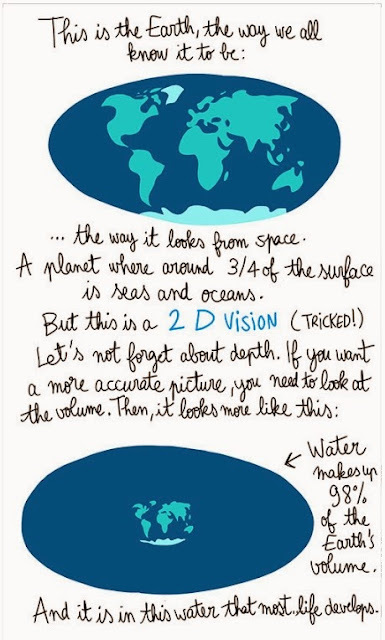 which resulted in the "long-term ocean acidification, ocean warming and vast areas of oxygen-poor ocean water." that extinguished nearly all life on the planet, something we are starting to see today thanks to the continued and unfettered use of fossil fuels, today's answer to the Siberian Traps, when it comes to producing CO2, the start point for all of the mass extinctions life has faced over that past 3.8 billions years. With this in mind, Last Hours is most apt don't you think? Maher gets it right on Kennedy, a president with style and wit, a president yours truly admired as someone who had a clear vision of what the world could be if one had the intellect and courage to make it so, a vision sadly not shared by any of Kennedy's successors following the unspeakable tragedy in Dallas on November 22, 1963. To this writer, one sensed Kennedy was different, especially when listening to his electrifying Inaugural speech that will live forever in the hearts of Americans who were alive at that time (including me) when he uttered the words Ask Not on a bitter cold day in Washington, January 20th, 1961. New Dan on Flickr shot this gem, another reason why the net rocks. Enjoy. In The Matrix, Agent Smith describes man as a virus, a species moving from place to place, consuming all resources of said place before moving on but now, there is no other place, a reality being played out as we speak, regarding the Monarch Butterfly, wild bees and other insects crucial to our survival. This year, for or the first time in memory, the monarch butterflies didn't come, at least not on the Day of the Dead. They began to straggle in a week later than usual, in record-low numbers. Last year’s low of 60 million now seems great compared with the fewer than three million that have shown up so far this year. Some experts fear that the spectacular migration could be near collapse. 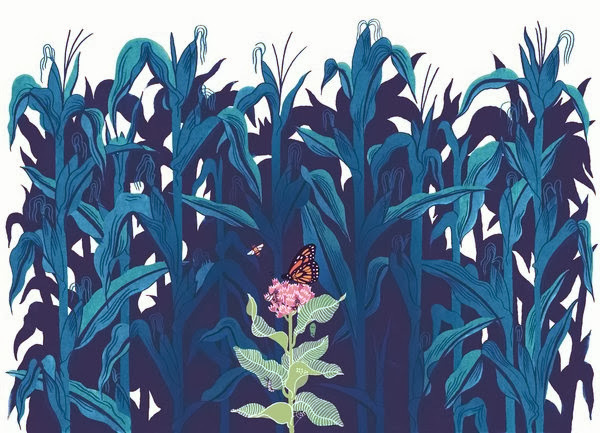 “It does not look good,” said Lincoln P. Brower, a monarch expert at Sweet Briar College. It is only the latest bad news about the dramatic decline of insect populations. Another insect in serious trouble is the wild bee, which has thousands of species. Nicotine-based pesticides called neonicotinoids are implicated in their decline, but even if they were no longer used, experts say, bees, monarchs and many other species of insect would still be in serious trouble. What's interesting is the fact Monsanto is a primary player in this sad scenario as the maker of Roundup, along with Bayer and Shell (Neonicotinoids), as GMO foods (corn/soy etc, etc.) require extensive use of Roundup and insecticides in order to survive, something that's beginning to change as nature always finds a way to subvert artificiality via, in the case of GMO corn, the corn borer beetle, as seen in a BRT post titled Monarchs & GMO Corn. For Agent Smith fans, here is the virus quote courtesy YouTube. Space is vast, so vast that one can actually see light moving through a nebula produced by a variable star known as V838, even though the speed of light in a vacuum = 186,000 miles per second. The unusual variable star V838 Monocerotis (V838 Mon) continues to puzzle astronomers. This previously inconspicuous star underwent an outburst early in 2002, during which it temporarily increased in brightness to become 600,000 times more luminous than our Sun. Light from this sudden eruption is illuminating the interstellar dust surrounding the star, producing the most spectacular “light echo” in the history of astronomy. As light from the eruption propagates outward into the dust, it is scattered by the dust and travels to the Earth. 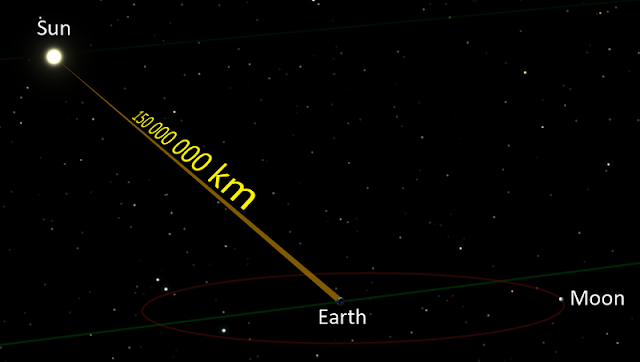 The scattered light has travelled an extra distance in comparison to light that reaches Earth directly from the stellar outburst. Such a light echo is the optical analogue of the sound echo produced when an Alpine yodel is reflected from the surrounding mountainsides. 8 minutes is all it takes for light from the sun to reach us rubes. 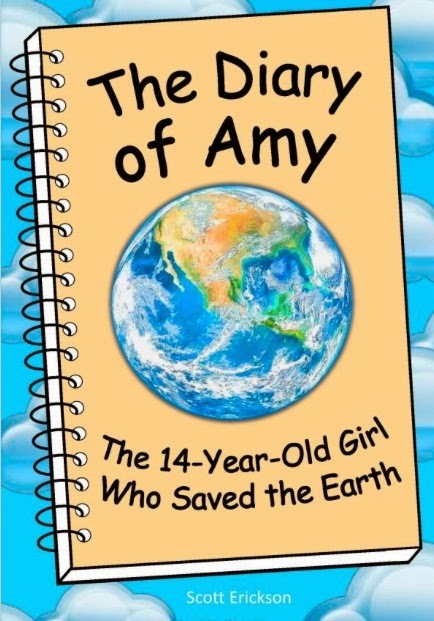 Scott Erickson's a terrific writer and environmentalist who cuts to the chase when it comes to explaining why growth is no longer sustainable using the clever alias of a 14 year old girl named Amy, who explains, in wonderfully clear language, where growth comes from and why it has to stop. Let’s say you get a loan for $100, but because of the interest you pay back $110. 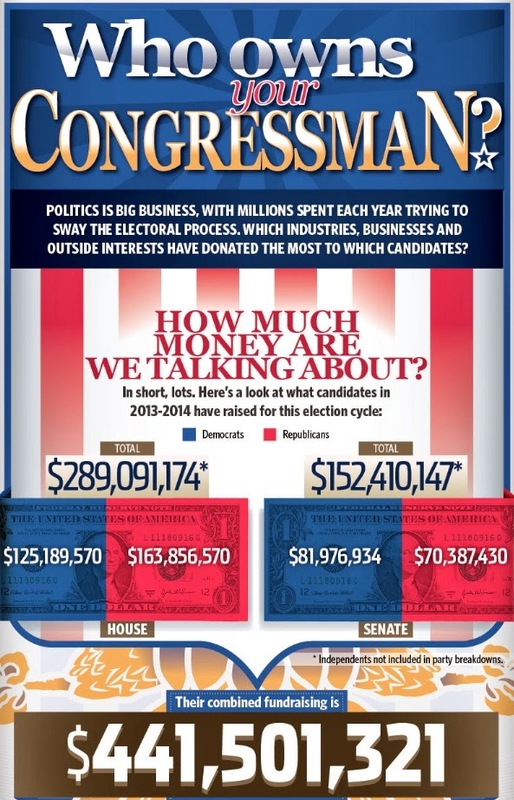 Here’s an interesting question: Where did that extra $10 come from? It didn’t come from you, since you can’t create money. Only banks can – by making loans. So the extra money could only come from one place: More loans! If you trace money to where money comes from, it almost always comes from a loan. People can get personal loans, but what’s more important for the economy is business loans – loans to start or expand a business. Of course all the loans have interest, which means paying back more money. 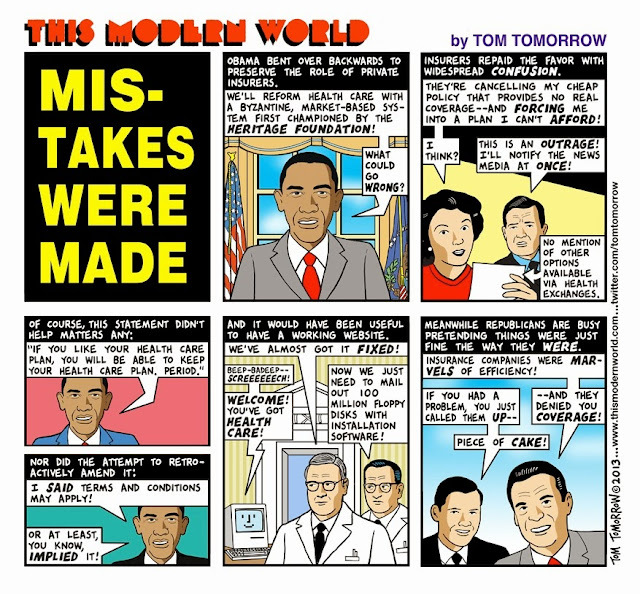 But we’ve already figured out that money is “created” by banks issuing loans. So to pay off past loans, somewhere else in the economy there has to be new loans which create more money. But then THOSE loans have to be paid off with money, which means MORE loans. Economic growth needs more money, but more money needs more economic growth, which needs more money. And it doesn’t stop. It can’t stop. This is why we’re addicted to economic growth. We’re not creating money; we’re creating debt! Like with any addiction, we keep doing it even when it’s not working any more. I like his splash image as well. Kind of says it all, don't you think? Like a moth drawn to a flame, one is drawn to the slow motion disaster known as Fukushima, an ongoing catastrophe that could end our short term residency on planet earth. What's even more terrifying is the fact a magnitude 7 earthquake (all that's needed to bring down the fuel pools @ Fukushima) hitting Japan within the next 3 years is estimated to be 95%, which could be the closest thing to a done deal regarding the most serious threat mankind has ever faced during his tenure on a tiny planet we call home. 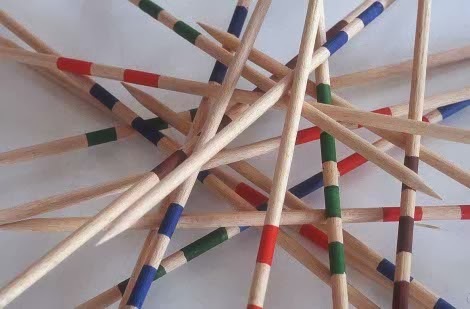 Pick-up-Sticks, a game requiring mental dexterity and physical skill under pressure, is basically what has to be done at Fukushima but with the added fun of having to pick up thousands of damaged rods loaded into damaged racks, which reside in a deteriorating, water filled environment in danger of collapsing at any moment. Adding to this rosy scenario are the absolute requirements that said rods must remain in water at all times (or they will explode) and cannot touch one another in any way, shape or fashion (or they will explode) because if they do either, uncontrolled fission will ensue, thus making Chernobyl a walk in the park. Factoids: Carefully plucking more than 1,500 brittle and potentially damaged fuel assemblies from the plant’s unstable Reactor No. 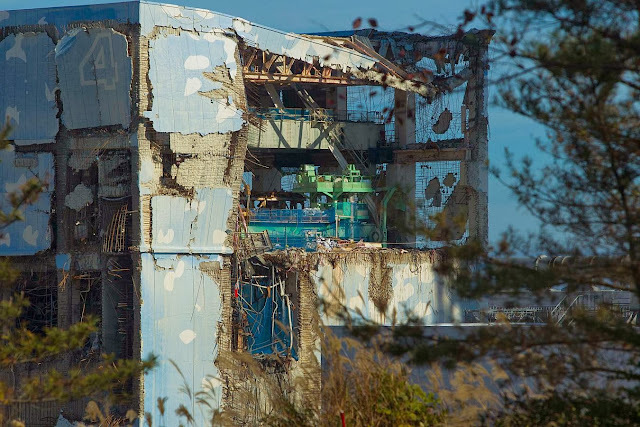 4 is expected to take about a year, and will be seen as a test of Tokyo Electric Power Co’s ability to move ahead with decommissioning the whole facility – a task likely to take decades and cost tens of billions of dollars. 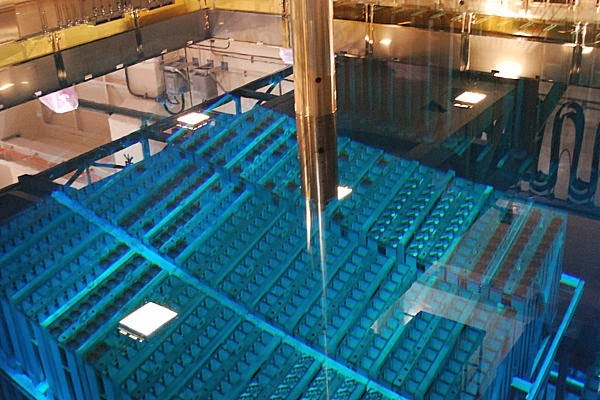 If the rods – there are 50-70 in each of the assemblies, which weigh around 300 kg (660 pounds) and are 4.5 metres (15 feet) long – are exposed to air or if they break, huge amounts of radioactive gases could be released into the atmosphere. Addendum: This is a picture showing the impact the earthquake and tsnuami had on Reactor 4's spent fuel rod pool building. Reassuring, right? Needless to say, the rods in the pool no longer look like this. 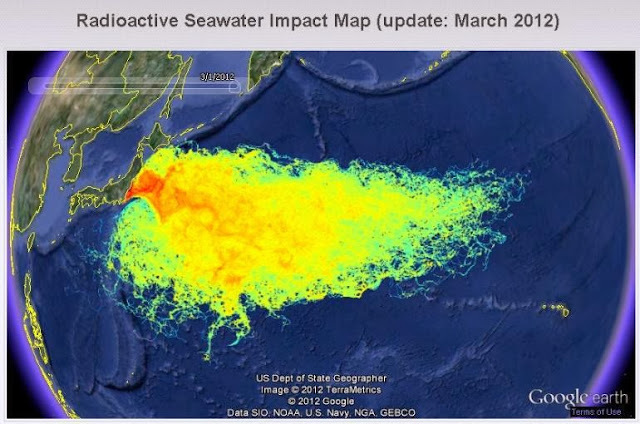 Any question as to why Fukushima is a fubar beyond description?